She thought she knew them well. It’s midsummer and the annual writing workshops are about to begin at the sprawling Devon home of novelist Eleanor Lambe. A group of old friends arrive to act as tutors, bringing past rivalries and resentments with them. They include Eleanor’s former lover, the charismatic poet Frank Marwell, and his new fiancée. The same night, Eleanor falls from her clifftop garden and lies in hospital, damaged, silent. Gossip says she jumped; the police rule out foul play. Her niece, Jo, sits at her bedside, waiting. Messy, complicated relationships mean tensions run high, made worse when Jo starts asking awkward questions. But what really happened that night? And will Eleanor ever remember? Click on the book cover to read the first chapter. 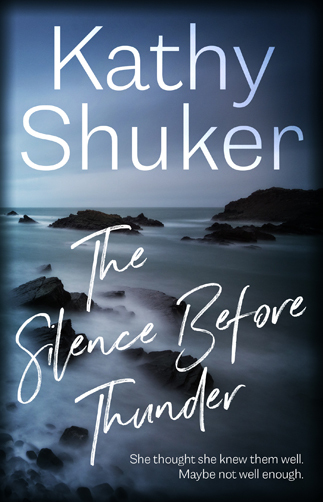 The Silence Before Thunder is also available as a paperback from Amazon, and by order from Waterstones and most bookshops. It is also in stock at The Harbour Bookshop in Kingsbridge and the Dartmouth Community Bookshop. My books are sometimes chosen to be read by book clubs and I’m thrilled to know that people are engaging with my stories and characters. It’s also interesting for me to hear your impressions and to see my characters through your eyes. If you have decided to read The Silence Before Thunder and would like more information about it, do get in touch. If your club is local to me, I should be happy to come and discuss it with you at a meeting if you would like; alternatively, we may be able to hook up on Skype. I have prepared a list of questions you may choose to consider after reading The Silence Before Thunder. Click here to download a copy for your club. I have prepared a list of questions you may choose to consider after reading The Silence Before Thunder. Click here to download a copy for your club. Be aware that the questions may contain spoilers!